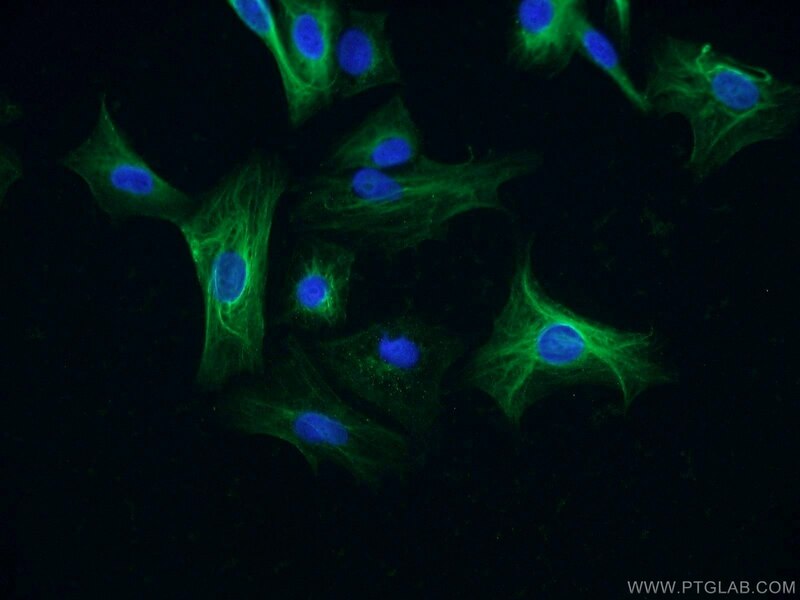 Immunohistochemical analysis of paraffin-embedded human breast cancer tissue slide using 55192-1-AP (CSNK1A1 antibody) at dilution of 1:200 (under 10x lens) heat mediated antigen retrieved with Tris-EDTA buffer(pH9). 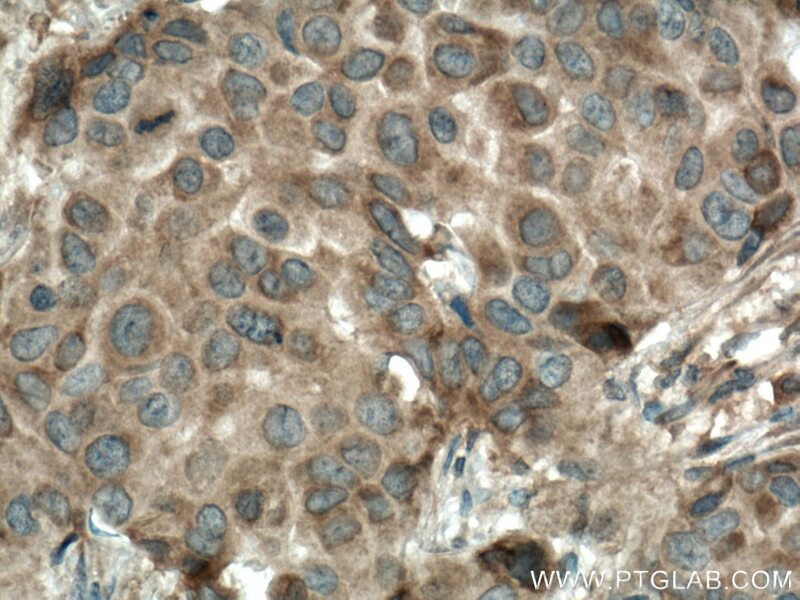 Immunohistochemical analysis of paraffin-embedded human breast cancer tissue slide using 55192-1-AP (CSNK1A1 antibody) at dilution of 1:200 (under 40x lens) heat mediated antigen retrieved with Tris-EDTA buffer(pH9). CSNK1A1, also named as CK1, belongs to the protein kinase superfamily, CK1 Ser/Thr protein kinase family and Casein kinase I subfamily. Casein kinases are operationally defined by their preferential utilization of acidic proteins such as caseins as substrates. CSNK1A1 can phosphorylate a large number of proteins. 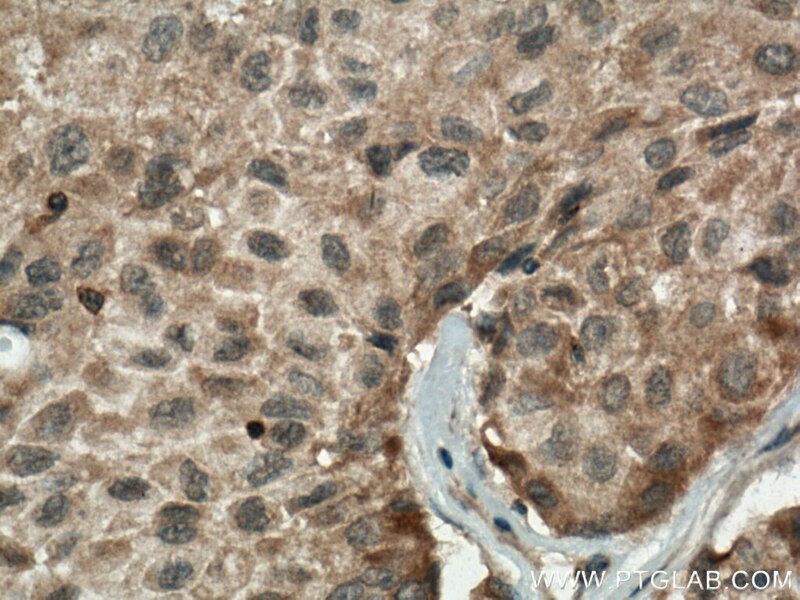 It participates in Wnt signaling. CSNK1A1 phosphorylates CTNNB1 at 'Ser-45'. May play a role in segregating chromosomes during mitosis. 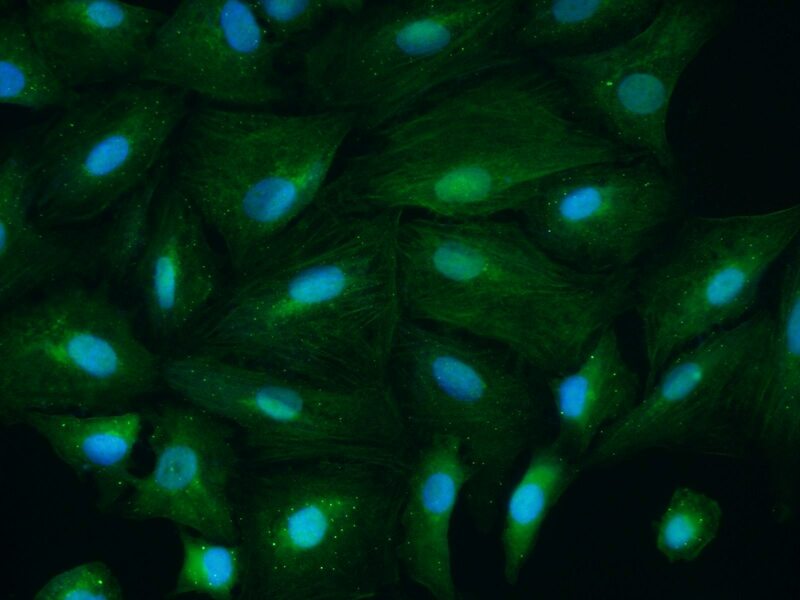 This antibody is specific to CSNK1A1. 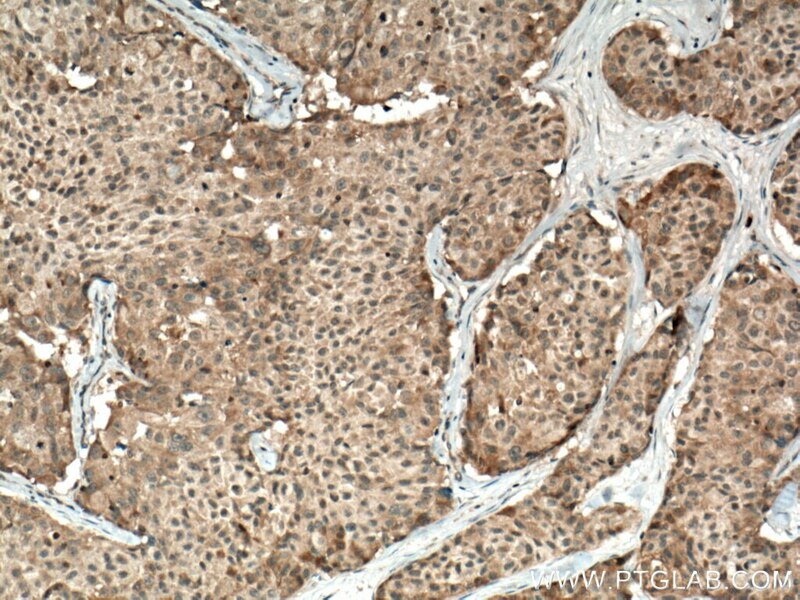 Immunohistochemical analysis of paraffin-embedded human lung cancer tissue slide using 55192-1-AP (CSNK1A1 antibody) at dilution of 1:200 (under 10x lens) heat mediated antigen retrieved with Tris-EDTA buffer(pH9). 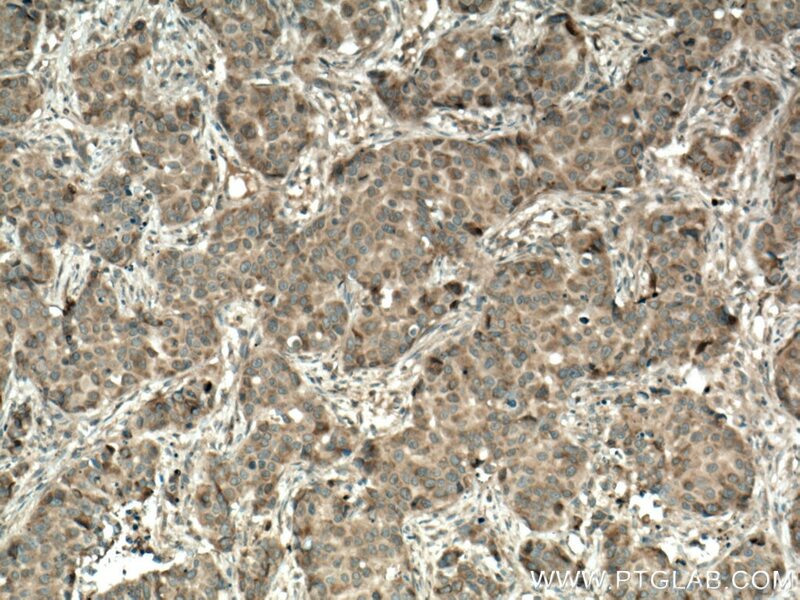 Immunohistochemical analysis of paraffin-embedded human lung cancer tissue slide using 55192-1-AP (CSNK1A1 antibody) at dilution of 1:200 (under 40x lens) heat mediated antigen retrieved with Tris-EDTA buffer(pH9).